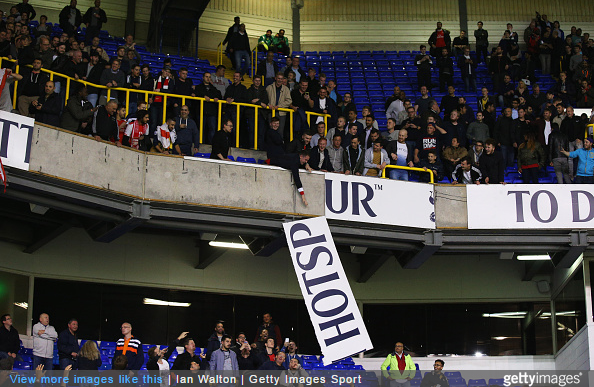 While hardly the most volatile North London Derby on record, last night’s Capital One Cup meeting between Tottenham and Arsenal at White Hart Lane still saw its fair share of uncouth behaviour. Not quite the “rampage” the Daily Mail are hooting about this morning, but still pretty juvenile stuff. As well as the banner removal service, there were also reports of “minor scuffles” between away fans and stewards both inside and outside the stadium during and after the game. So, all in all, pretty much your typical NLD. Shouldn’t be too difficult to identify these from the photos, find them and flog them. Love that we got the victory … but these bums must be banned. Sorry, folks, no room for that. Ban them from all stadiums for life.